Ahmose I (Ancient Egyptian: jꜥḥ ms(j.w), Egyptological pronunciation Ahmose, sometimes written Amosis I, "Amenes" and "Aahmes" and meaning "Iah is born") was a pharaoh and founder of the Eighteenth Dynasty of Egypt. He was a member of the Theban royal house, the son of pharaoh Seqenenre Tao and brother of the last pharaoh of the Seventeenth dynasty, Kamose. During the reign of his father or grandfather, Thebes rebelled against the Hyksos, the rulers of Lower Egypt. When he was seven years old, his father was killed, and he was about ten when his brother died of unknown causes after reigning only three years. Ahmose I assumed the throne after the death of his brother, and upon coronation became known as nb-pḥtj-rꜥ "The Lord of Strength is Ra". During his reign, Ahmose completed the conquest and expulsion of the Hyksos from the Nile Delta, restored Theban rule over the whole of Egypt and successfully reasserted Egyptian power in its formerly subject territories of Nubia and Canaan. He then reorganized the administration of the country, reopened quarries, mines and trade routes and began massive construction projects of a type that had not been undertaken since the time of the Middle Kingdom. This building program culminated in the construction of the last pyramid built by native Egyptian rulers. Ahmose's reign laid the foundations for the New Kingdom, under which Egyptian power reached its peak. His reign is usually dated to the mid-16th century BC. Ahmose descended from the Theban Seventeenth Dynasty. His grandfather and grandmother, Senakhtenre Ahmose and Tetisheri, had at least twelve children, including Seqenenre Tao and Ahhotep I. The brother and sister, according to the tradition of Egyptian queens, married; their children were Kamose, Ahmose I, and several daughters. Ahmose I followed in the tradition of his father and married several of his sisters, making Ahmose-Nefertari his chief wife. They had several children including daughters Meritamun B, Sitamun A and sons Siamun A, Ahmose-ankh, Amenhotep I and Ramose A (the "A" and "B" designations after the names are a convention used by Egyptologists to distinguish between royal children and wives that otherwise have the same name). They may also have been the parents of Mutnofret, who would become the wife of later successor Thutmose I. Ahmose-ankh was Ahmose's heir apparent, but he preceded his father in death sometime between Ahmose's 17th and 22nd regnal year. Ahmose was succeeded instead by his eldest surviving son, Amenhotep I, with whom he might have shared a short coregency. There was no distinct break in the line of the royal family between the 17th and 18th dynasties. The historian Manetho, writing much later during the Ptolemaic Kingdom, considered the final expulsion of the Hyksos after nearly a century and the restoration of native Egyptian rule over the whole country a significant enough event to warrant the start of a new dynasty. Ahmose's reign can be fairly accurately dated using the Heliacal rise of Sirius in his successor's reign, but because of disputes over from where the observation was made, he has been assigned a reign from 1570–1546, 1560–1537 and 1551–1527 by various sources. Manetho supposedly gives Ahmose a reign of 25 years and 4 months (but, as Manetho called the first ruler of his dynasty "Tethmosis", he probably intended someone else). This figure is seemingly supported by a 'Year 22' inscription from his reign at the stone quarries of Tura. A medical examination of his mummy indicates that he died when he was about thirty-five, supporting a 25-year reign if he came to the throne at the age of 10. The radiocarbon date range for the start of his reign is 1570–1544 BC, the mean point of which is 1557 BC. Alternative dates for his reign (1194 to 1170 BC) were suggested by David Rohl, but these were rejected by the majority of Egyptologists even before the radiocarbon date was published in 2010. The conflict between the local kings of Thebes and the Hyksos king Apepi had started during the reign of Ahmose's father, Seqenenre Tao, and would be concluded, after almost 30 years of intermittent conflict and war, during his own reign. Seqenenre Tao was possibly killed in a battle against the Hyksos, as his much-wounded mummy gruesomely suggests, and his successor Kamose (likely Ahmose's elder brother) is known to have attacked and raided the lands around the Hyksos capital, Avaris (modern Tell el-Dab'a). Kamose evidently had a short reign, as his highest attested regnal year is year 3, and was succeeded by Ahmose I. Apepi may have died near the same time. The two royal names—Awoserre and Aqenienre—known for Apepi attested in the historical record were for the same Hyksos king that were used by Ahmose's opponent at different times during the latter king's reign. 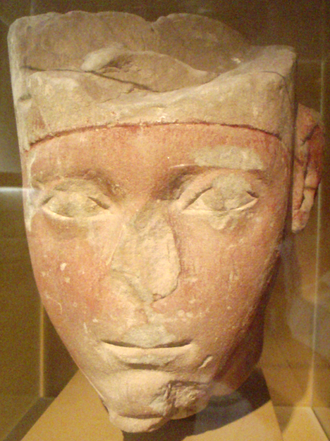 Ahmose ascended the throne when he was still a child, so his mother, Ahhotep, reigned as regent until he was of age. 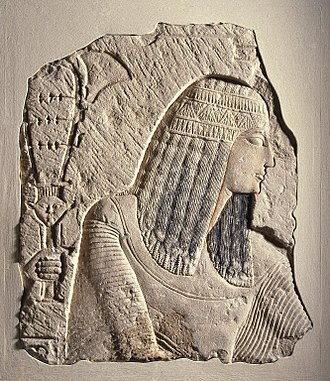 Judging by some of the descriptions of her regal roles while in power, including the general honorific "carer for Egypt", she effectively consolidated the Theban power base in the years before Ahmose assumed full control. If in fact Apepi II was a successor to Apepi I, then he is thought to have remained bottled up in the delta during Ahhotep's regency, because his name does not appear on any monuments or objects south of Bubastis. Regnal year 11, second month of shomu, Heliopolis was entered. First month of akhet, day 23, this southern prince broke into Tjaru. 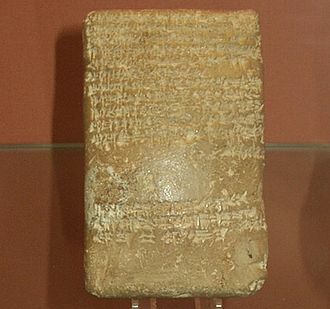 "it is reasonable to expect a Theban-oriented text to describe its Pharaoh in this manner? For if the date refers to Ahmose, then the scribe must have been an adherent of that ruler. To me, the very indirect reference to Ahmose—it must be Ahmose—ought to indicate a supporter of the Hyksos dynasty; hence, the regnal years should refer to this monarch and not the Theban [king]." The Rhind Papyrus illustrates some of Ahmose's military strategy when attacking the Delta. Entering Heliopolis in July, he moved down the eastern delta to take Tjaru, the major border fortification on the Horus Road, the road from Egypt to Canaan, in October, totally avoiding Avaris. In taking Tjaru he cut off all traffic between Canaan and Avaris. This indicates he was planning a blockade of Avaris, isolating the Hyksos capital from help or supplies coming from Canaan. Records of the latter part of the campaign were discovered on the tomb walls of a participating soldier, Ahmose, son of Ebana. These records indicate that Ahmose I led three attacks against Avaris, the Hyksos capital, but also had to quell a small rebellion further south in Egypt. After this, in the fourth attack, he conquered the city. He completed his victory over the Hyksos by conquering their stronghold Sharuhen near Gaza after a three-year siege. Ahmose would have conquered Avaris by the 18th or 19th year of his reign at the very latest. This is suggested by "a graffito in the quarry at Tura whereby 'oxen from Canaan' were used at the opening of the quarry in Ahmose's regnal year 22." Since the cattle would probably have been imported after Ahmose's siege of the town of Sharuhen which followed the fall of Avaris, this means that the reign of Khamudi must have terminated by Year 18 or 19 of Ahmose's 25-year reign at the very latest. After defeating the Hyksos, Ahmose began campaigning in Syria and Nubia. A campaign during his 22nd year reached Djahy in the Levant and perhaps as far as the Euphrates, although the later Pharaoh Thutmose I is usually credited with being the first to campaign that far. Ahmose did, however, reach at least as far as Kedem (thought to be near Byblos), according to an ostracon in the tomb of his wife, Ahmose-Nefertari. Details on this particular campaign are scarce, as the source of most of the information, Ahmose, son of Ebana, served in the Egyptian navy and did not take part in this land expedition. However, it can be inferred from archaeological surveys of southern Canaan that during the late 16th century BC Ahmose and his immediate successors intended only to break the power of the Hyksos by destroying their cities and not to conquer Canaan. Many sites there were completely laid waste and not rebuilt during this period—something a Pharaoh bent on conquest and tribute would not be likely to do. With the re-unification of Upper and Lower Egypt under Ahmose, a renewal of royal support for the arts and monumental construction occurred. Ahmose reportedly devoted a tenth of all the productive output towards the service of the traditional gods, reviving massive monumental constructions as well as the arts. However, as the defeat of the Hyksos occurred relatively late in Ahmose's reign, his subsequent building program likely lasted no more than seven years, and much of what was started was probably finished by his son and successor Amenhotep I.
Fragments of an armband of Ahmose I, Musée du Louvre. Work from Ahmose's reign is made of much finer material than anything from the Second Intermediate Period, though the craftsmanship from his reign does not always match the best work from either the Old or Middle Kingdoms. 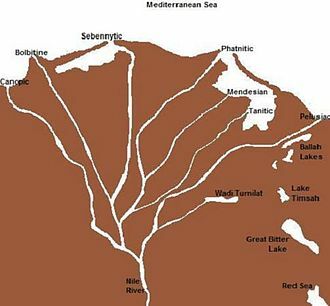 With the Delta and Nubia under Egyptian control once more, access was gained to resources not available in Upper Egypt. Gold and silver were received from Nubia, Lapis Lazuli from distant parts of central Asia, cedar from Byblos, and in the Sinai the Serabit el-Khadim turquoise mines were reopened. Although the exact nature of the relationship between Egypt and Crete is uncertain, at least some Minoan designs have been found on objects from this period, and Egypt considered the Aegean to be part of its empire. 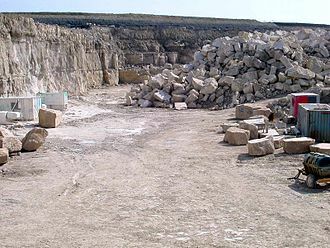 Ahmose reopened the Tura limestone quarries to provide stone for monuments and used Asiatic cattle from Phoenicia to haul the stone, according to his quarry inscription. The art during Ahmose I's reign was similar to the Middle Kingdom royal Theban style, and stelae from this period were once more of the same quality. This reflects a possibly natural conservative tendency to revive fashions from the pre-Hyksos era. Despite this, only three positively identified statuary images of Ahmose I survive: a single shabti kept at the British Museum, presumably from his tomb (which has never been positively located), and two life-size statues; one of which resides in the New York Metropolitan Museum, the other in the Khartoum Museum. All display slightly bulging eyes, a feature also present on selected stelae depicting the pharaoh. Based on style, a small limestone sphinx that resides at the National Museum of Scotland, Edinburgh, has also been tentatively identified as representing Ahmose I. The art of glass making is thought to have developed during Ahmose's reign. The oldest samples of glass appear to have been defective pieces of faience, but intentional crafting of glass did not occur until the beginning of the 18th dynasty. One of the earliest glass beads found contains the names of both Ahmose and Amenhotep I, written in a style dated to about the time of their reigns. If glassmaking was developed no earlier than Ahmose's reign and the first objects are dated to no later than his successor's reign, it is quite likely that it was one of his subjects who developed the craft. Under Ahmose's reign, the city of Thebes became the capital for the whole of Egypt, as it had been under the 11th Dynasty in the early Middle Kingdom. It also became the center for a newly established professional civil service, where there was a greater demand for scribes and the literate as the royal archives began to fill with accounts and reports. Having Thebes as the capital was probably a strategic choice as it was located at the center of the country, the logical conclusion from having had to fight the Hyksos in the north as well as the Nubians to the south. Any future opposition at either border could be met easily. Perhaps the most important shift was a religious one: Thebes effectively became the religious as well as the political center of the country, its local god Amun credited with inspiring Ahmose in his victories over the Hyksos. 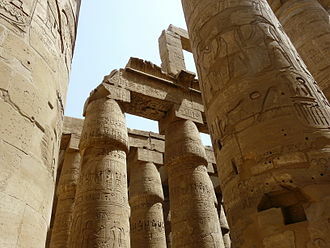 The importance of the temple complex at Karnak (on the east bank of the Nile north of Thebes) grew and the importance of the previous cult of Ra based in Heliopolis diminished. Several stelae detailing the work done by Ahmose were found at Karnak, two of which depict him as a benefactor to the temple. In one of these stelae, known as the "Tempest Stele", he claims to have rebuilt the pyramids of his predecessors at Thebes that had been destroyed by a major storm. The Thera eruption in the Aegean has been implicated by some scholars as the source of the damages described in the Tempest Stele. The remains of Ahmose's pyramid in Abydos were discovered in 1899 and identified as his in 1902. Most of its outer casing stones had been robbed for use in other building projects over the years, and the mound of rubble upon which it was built has collapsed. However, two rows of intact casing stones were found by Arthur Mace, who estimated its steep slope as about 60 degrees, based on the evidence of the limestone casing (compare to the less acute 51 degrees of the Great Pyramid of Giza). Adjacent to the main pyramid temple and to its east, Harvey has identified two temples constructed by Ahmose's queen, Ahmose-Nefertary. One of these structures also bears bricks stamped with the name of Chief Treasurer Neferperet, the official responsible for re-opening the stone quarries at el-Ma'asara (Tura) in Ahmose's year 22. A third, larger temple (Temple C) is similar to the pyramid temple in form and scale, but its stamped bricks and details of decoration reinforce that it was a cult place for Ahmose-Nefertary. There is some dispute as to if this pyramid was Ahmose's burial place, or if it was a cenotaph. Although earlier explorers Mace and Currelly were unable to locate any internal chambers, it is unlikely that a burial chamber would have been located in the midst of the pyramid's rubble core. In the absence of any mention of a tomb of King Ahmose in the tomb robbery accounts of the Abbott Papyrus, and in the absence of any likely candidate for the king's tomb at Thebes, it is possible that the king was interred at Abydos, as suggested by Harvey. Certainly the great number of cult structures located at the base of the pyramid located in recent years, as well as the presence at the base of the pyramid of a cemetery used by priests of Ahmose's cult, argue for the importance of the king's Abydos cult. However, other Egyptologists believe that the pyramid was constructed (like Tetisheri's pyramid at Abydos) as a cenotaph and that Ahmose may have originally been buried in the southern part of Dra' Abu el-Naga' with the rest of the late 17th and early 18th Dynasties. This pyramid was the last pyramid ever built as part of a mortuary complex in Egypt. The pyramid would be abandoned by subsequent pharaohs of the New Kingdom, for both practical and religious reasons. 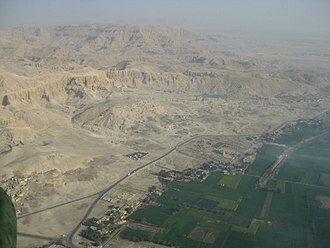 The Giza plateau offered plenty of room for building pyramids; but this was not the case with the confined, cliff-bound geography of Thebes and any burials in the surrounding desert were vulnerable to flooding. The pyramid form was associated with the sun god Re, who had been overshadowed by Amun in importance. One of the meanings of Amun's name was the hidden one, which meant that it was now theologically permissible to hide the Pharaoh's tomb by fully separating the mortuary template from the actual burial place. This provided the added advantage that the resting place of the pharaoh could be kept hidden from necropolis robbers. All subsequent pharaohs of the New Kingdom would be buried in rock-cut shaft tombs in the Valley of the Kings. Ahmose I's mummy was unwrapped by Gaston Maspero on June 9, 1886. It was found within a coffin that bore his name in hieroglyphs, and on his bandages his name was again written in hieratic script. While the cedarwood coffin's style dates it squarely to the time of the 18th dynasty, it was neither of royal style nor craftsmanship, and any gilding or inlays may have been stripped in antiquity. He had evidently been moved from his original burial place, re-wrapped and placed within the cache at Deir el-Bahri during the reign of the 21st dynasty priest-king Pinedjem II, whose name also appeared on the mummy's wrappings. Around his neck a garland of Delphinium flowers had been placed. The body bore signs of having been plundered by ancient grave-robbers, his head having been broken off from his body and his nose smashed. ...he was of medium height, as his body when mummified measured only 5 feet 6 inches (1.68 m) in length, but the development of the neck and chest indicates extraordinary strength. The head is small in proportion to the bust, the forehead low and narrow, the cheek-bones project and the hair is thick and wavy. The face exactly resembles that of Tiûâcrai [Seqenenre Tao] and the likeness alone would proclaim the affinity, even if we were ignorant of the close relationship which united these two Pharaohs. Initial studies of the mummy were first thought to reveal a man in his 50s, but subsequent examinations have shown that he was instead likely to have been in his mid-30s when he died. The identity of this mummy (Cairo Museum catalog n° 61057) was called into question in 1980 by the published results of Dr. James Harris, a professor of orthodontics, and Egyptologist Edward Wente. Harris had been allowed to take x-rays of all of the supposed royal mummies at the Cairo Museum. While history records Ahmose I as being the son or possibly the grandson of Seqenenre Tao, the craniofacial morphology of the two mummies are quite different. It is also different from that of the female mummy identified as Ahmes-Nefertari, thought to be his sister. These inconsistencies, and the fact that this mummy was not posed with arms crossed over chest, as was the fashion of the period for male royal mummies, led them to conclude that this was likely not a royal mummy, leaving the identity of Ahmose I unknown. The first piece of evidence consists of three small objects which contain both of their praenomen next to one another: the aforementioned small glass bead, a small feldspar amulet and a broken stele, all of which are written in the proper style for the early 18th dynasty. The last stele said that Amenhotep was "given life eternally", which is an Egyptian idiom meaning that a king is alive, but the name of Ahmose does not have the usual epithet "true of voice" which is given to dead kings. Since praenomen are only assumed upon taking the throne, and assuming that both were in fact alive at the same time, it is indicated that both were reigning at the same time. There is, however, the possibility that Amenhotep I merely wished to associate himself with his beloved father, who reunited Egypt. Because of this uncertainty, a co-regency is currently impossible to prove or disprove. Both Redford's and Murnane's works on the subject are undecided on the grounds that there is too little conclusive evidence either for or against a coregency. Even if there was one, it would have made no difference to the chronology of the period because in this kind of institution Amenhotep would have begun counting his regnal dates from his first year as sole ruler. However, co-regency supporters note that since at least one rebellion had been led against Ahmose during his reign, it would certainly have been logical to crown a successor before one's death to prevent a struggle for the crown. ^ a b c d e Clayton (2006) p. 100. ^ a b c Wiener and Allen (1998) p. 3. ^ a b Shaw. (2000) p. 199. ^ a b Grimal. (1988) p. 192. ^ a b Grimal. (1988) p. 194. ^ a b Grimal. (1988) p. 190. ^ a b c Wente (1975) p. 271. ^ Redford. (1965) p. 28. ^ a b c d Grimal. (1988) p. 193. ^ Breasted, James Henry. Ancient Records of Egypt, Vol. II p. 12. University of Chicago Press, Chicago, 1906. ^ a b Redford. (1992) p. 71. ^ Ahram (2005) Accessed August 23, 2006. ^ a b Redford. (1992) p. 195. ^ a b c d Maspero, Gaston. History Of Egypt, Chaldaea, Syria, Babylonia, and Assyria, Volume 4 (of 12), Project Gutenberg EBook, Release Date: December 16, 2005. EBook #17324. ^ a b Catalogue Général 34001, Egyptian Museum, Cairo. ^ a b Quarry Inauguration, accessed July 28, 2006. ^ a b Edna R. Russman et al. 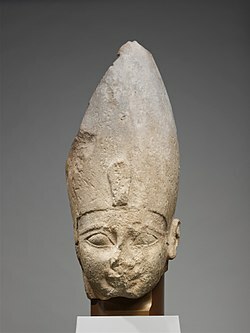 Eternal Egypt: Masterworks of Ancient Art from the British Museum, pp. 210–211. ^ a b c d Gordon, Andrew H. A Glass Bead of Ahmose and Amenhotep I. p. 296. Journal of Near Eastern Studies, vol. 41, no. 4, October 1982. ^ Tyldesley, Joyce. The Private Lives of the Pharaohs, p. 100. Channel 4 Books, 2004. ^ Egyptian Pharaohs: Ahmose I, accessed July 19, 2006. ^ Ahmose Pyramid at Abydos, accessed July 22, 2006. ^ a b Lehner, Mark. The Complete Pyramids, p. 191. Thames & Hudson Ltd, 1997. ^ Tyldesley, Joyce. The Private Lives of the Pharaohs, p. 101. Channel 4 Books, 2004. ^ Forbes, Dennis C. Tombs, Treasures, Mummies: Seven Great Discoveries of Egyptian Archaeology, p. 699. KMT Communications, Inc. 1998. ^ Bickerstaff, Dylan. Examining the Mystery of the Niagara Falls Mummy , KMT, p. 31. Vol. 17 Number 4, Winter 2006–07. ^ Gordon, Andrew H. A Glass Bead of Ahmose and Amenhotep I p.297. Journal of Near Eastern Studies, vol. 41, no. 4, October 1982. ^ Redford. (1967) p. 51. ^ Murnane, William J. Ancient Egyptian Coregencies, Studies in Ancient Oriental Civilization, N° 40, p.114. The Oriental Institute of the University of Chicago, 1977. Clayton, Peter (2006). Chronicle of the Pharaohs. Thames and Hudson Ltd. ISBN 978-0-500-28628-9. Dodson, Aidan (1990). "Crown Prince Djhutmose and the Royal Sons of the Eighteenth Dynasty". The Journal of Egyptian Archaeology. 76: 87–96. doi:10.2307/3822009. JSTOR 3822009. El-Aref, Nevine. "King of the Wild Frontier". Al-Ahram. Archived from the original on 31 July 2010. Retrieved 2010-08-13. Gardiner, Alan (1964). Egypt of the Pharaohs. Oxford University Press. ISBN 978-0-19-500267-6. Redford, Donald (1992). Egypt, Canaan, and Israel in Ancient Times. Princeton University Press. ISBN 978-0-691-00086-2. Shaw, Ian; Nicholson, Paul (1995). The Dictionary of Ancient Egypt. Harry N. Abrams, Inc. ISBN 978-0-8109-9096-8. Wente, Edward F. (1975). "Thutmose III's Accession and the Beginning of the New Kingdom". Journal of Near Eastern Studies. 57 (1): 265–272. doi:10.1086/372429. Wiener, Malcolm H.; Allen, James P. (1998). "Separate Lives: The Ahmose Tempest Stela and the Thera Eruption". Journal of Near Eastern Studies. 57 (1): 1–28. doi:10.1086/468596. Wikimedia Commons has media related to Ahmose I.
Ahmose accessed 19 July 2006. Egyptian Pharaohs: Ahmose I accessed 19 July 2006. Quarry Inauguration Accessed 28 July 2006. Amun was a major Ancient Egyptian deity. He was attested since the Old Kingdom together with his wife Amaunet, with the 11th dynasty, he rose to the position of patron deity of Thebes by replacing Monthu. After the rebellion of Thebes against the Hyksos and with the rule of Ahmose I, Amun acquired national importance, expressed in his fusion with the Sun god, Ra, Amun-Ra retained chief importance in the Egyptian pantheon throughout the New Kingdom. Amun-Ra in this period held the position of transcendental, self-created creator deity par excellence, he was the champion of the poor or troubled and his position as King of Gods developed to the point of virtual monotheism where other gods became manifestations of him. With Osiris, Amun-Ra is the most widely recorded of the Egyptian gods, as the chief deity of the Egyptian Empire, Amun-Ra came to be worshipped outside of Egypt, according to the testimony of ancient Greek historiographers in Libya and Nubia. As Zeus Ammon he came to be identified with Zeus in Greece and Amaunet are mentioned in the Old Egyptian Pyramid Texts. The name Amun meant something like the one or invisible. Amun rose to the position of tutelary deity of Thebes after the end of the First Intermediate Period, as the patron of Thebes, his spouse was Mut. In Thebes, Amun as father, Mut as mother and the Moon god Khonsu formed a family or Theban Triad. The history of Amun as the god of Thebes begins in the 20th century BC. The city of Thebes does not appear to have been of great significance before the 11th dynasty, major construction work in the Precinct of Amun-Re took place during the 18th dynasty when Thebes became the capital of the unified ancient Egypt. Construction of the Hypostyle Hall may have begun during the 18th dynasty, though most building was undertaken under Seti I. Merenptah commemorated his victories over the Sea Peoples on the walls of the Cachette Court and this Great Inscription shows the kings campaigns and eventual return with booty and prisoners. Next to this inscription is the Victory Stela, which is largely a copy of the more famous Israel Stela found in the complex of Merenptah on the west bank of the Nile in Thebes. Ahmose-Nefertari of Ancient Egypt was the first Queen of the 18th Dynasty. She was a daughter of Seqenenre Tao and Ahhotep I, and royal sister and she was the mother of king Amenhotep I and may have served as his regent when he was young. Ahmose-Nefertari was deified after her death, Ahmose-Nefertari was a daughter of Seqenenre Tao and Ahhotep I and the granddaughter of Senakhtenre and queen Tetisheri. Ahmose-Nefertari was born in Thebes, likely during the reign of Senakhtenre Ahmose, Ahmose-Nefertari may have married Pharaoh Kamose, but if so there is no record of such a marriage. She did become the royal wife of pharaoh, Ahmose I. With Ahmose she had at least three sons and she was the mother of queen Ahmose-Meritamun and Ahmose-Sitamun. She may have been the mother of Mutnofret, the wife of Thutmose I, a prince named Ramose included among the Lords of the West and known from a statue now in Liverpool, may be another son of Ahmose-Nefertari. Ahmose-Nefertari was born during the part of the seventeenth dynasty. Her father Seqenenre Tao fought against the Hyksos and may have lost his life during a battle and it is possible that Ahmose-Nefertari married Kamose, but no evidence exists of such a marriage. After the death of Kamose the throne went to Ahmose I, Pharaoh Ahmose was very young and queen-mother Ahhotep I served as regent during the early years of his reign. Ahhotep would have taken precedence at court over her daughter Ahmose-Nefertari, Ahmose I became the first king of the eighteenth dynasty, a pharaoh ruling over a reunited country. The queen was revered as Goddess of Resurrection and was arguably the most venerated women in Egyptian history, a donation stela from Karnak records how king Ahmose purchased the office of Second Prophet of Amun and endowed the position with land and administrators. The endowment was given to Ahmose-Nefertari and her descendants, separately the position of Divine adoratrix was given to Ahmose-Nefertari. Amenhotep I came to power while he was still young, as his mother, Ahmose-Nefertari, may have served as regent for him until he reached maturity. Ahmose-Meritamun was a Queen of Egypt during the early Eighteenth dynasty of Egypt. She was both the sister and the wife of Pharaoh Amenhotep I and she died fairly young and was buried in tomb TT358 in Deir el-Bahari. Ahmose-Meritamun was the daughter of Ahmose I and Ahmose Nefertari. Meritamun took over the role of Gods Wife of Amun from her mother Ahmose Nefertari. Other titles recorded for Meritamun include, lady of the two lands, King’s Wife, mistress of the two lands, god’s wife, united with the white crown, king’s daughter, and king’s sister. The title king’s mother is recorded in sources, even though she was never the mother of a king. A limestone statue of this queen was discovered by Giovanni Belzoni while he was working in Karnak in 1817, ahmose-Meritamun is depicted in the tomb of Inherkau which dates to the 20th dynasty as one of the Lords of the West. She is shown in the top row behind Queen Ahhotep I and her remains were discovered at Deir el-Bahri in TT358 in 1930 by Herbert Eustis Winlock. Ahmose I was a pharaoh of ancient Egypt and the founder of the Eighteenth dynasty. He was a member of the Theban royal house, the son of pharaoh Seqenenre Tao and brother of the last pharaoh of the Seventeenth dynasty, during the reign of his father or grandfather, Thebes rebelled against the Hyksos, the rulers of Lower Egypt. When he was seven years old his father was killed, and he was ten when his brother died of unknown causes. Ahmose I assumed the throne after the death of his brother, the name Ahmose is a combination of the divine name Ah and the combining form -mose. 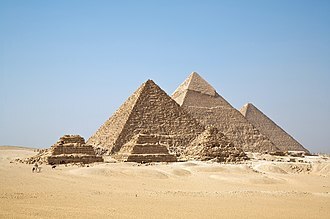 This building program culminated in the construction of the last pyramid built by native Egyptian rulers, Ahmoses reign laid the foundations for the New Kingdom, under which Egyptian power reached its peak. His reign is dated to the mid-16th century BC. Ahmose descended from the Theban Seventeenth Dynasty and his grandfather and grandmother, Senakhtenre Ahmose and Tetisheri, had at least twelve children, including Seqenenre Tao and Ahhotep. The brother and sister, according to the tradition of Egyptian queens, their children were Kamose, Ahmose I, Ahmose I followed in the tradition of his father and married several of his sisters, making Ahmose-Nefertari his chief wife. They had several children including daughters Meritamun B, Sitamun A and sons Siamun A, Ahmose-ankh, Amenhotep I and they may have been the parents of Mutnofret, who would become the wife of successor Thutmose I. Ahmose-ankh was Ahmoses heir apparent, but he preceded his father in death sometime between Ahmoses 17th and 22nd regnal year, Ahmose was succeeded instead by his eldest surviving son, Amenhotep I, with whom he might have shared a short coregency. There was no break in the line of the royal family between the 17th and 18th dynasties. 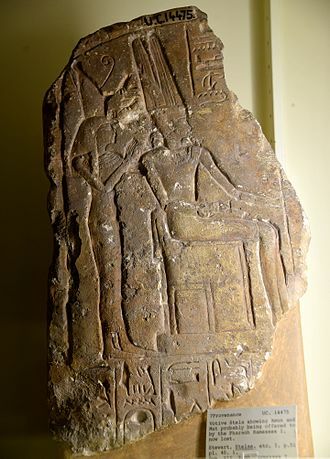 Manetho supposedly gives Ahmose a reign of 25 years and 4 months and this figure is seemingly supported by a Year 22 inscription from his reign at the stone quarries of Tura. A medical examination of his mummy indicates that he died when he was about thirty-five, the radiocarbon date range for the start of his reign is 1570–1544 BC, the mean point of which is 1557 BC. Statue of Raherka, 2350BC, 4th/5th Dynasty. Relief of Amenhotep I from Karnak. 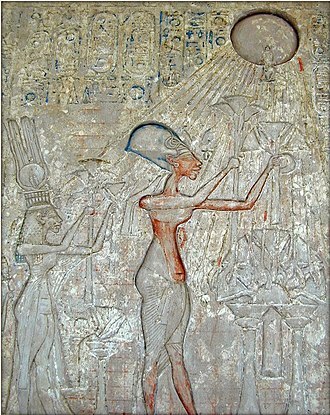 Ahmose-Henuttamehu is shown with another royal lady - possibly her mother Ahmose-Inhapi - behind her. Prince Sipair, unknown royal lady, Queen Ahmose, Queen Tures, and Queen Henuttamehu - Tomb of Khabeknet in Thebes. Ahmose-Nefertari and her son Amenhotep I.